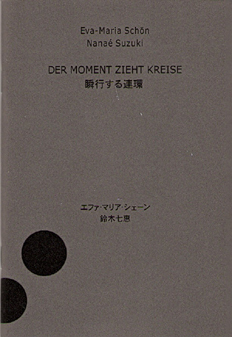 The Japanese artist Nanaé Suzuki (b. 1947) is concerned with transforming sight and memory and since 1981 has been living in Berlin, where she is known mainly for her surreal images of architecture. Between two fingers she holds the world. The round cut-outs of postcards, which she has photographed spinning between forefinger and thumb, suggest a world spinning too fast to be seen clearly, since postcards show parts of it travelled to. Blurred by the spinning, the flat image resembles a soap-bubble reflecting its surroundings dimly, like sights in Berlin where Nanaé Suzuki has been living since 1981. Common to many of her works are giddiness and a playing with perspective, having us experience space in a new way at the flip of a hand - a concern which tallied in the 80s with the general concern in Berlin about how to use city space, public squares and alternative sites for exhibitions. 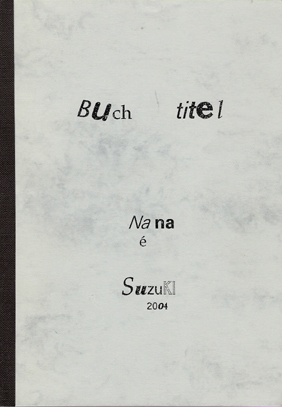 Educated in Tokyo, Nanaé Suzuki contributed a new poetic element. The antithesis between her small formats and often monumental motifs record a longing to see the world as a whole before it again breaks up into its parts. 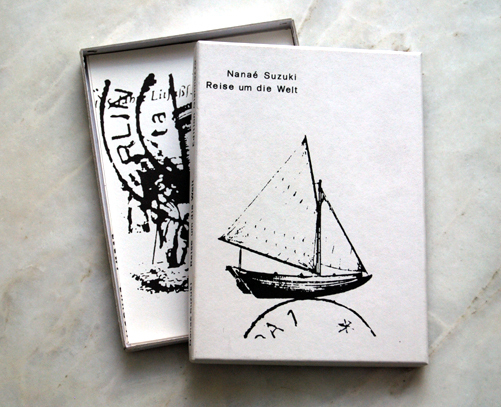 Her techniques - water-colour, folded paper, photography and wall pictures - involve no costly media. 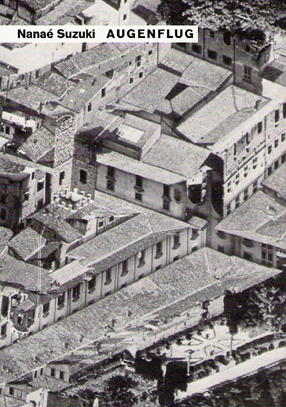 Traditionally, the representation of three dimensional space in flat images has been different in Asia to in Europe. In the west since Brunelleschi, a unified perspective has led to a single vanishing point, whereas in Asia the viewer has moved from one point of view to another in scroll painting. Scrolls and screens often present a bird's eye view of a landscape, whose parts are thus all at a similar distance to the viewer. From 1993 to 1998 Nanaé Suzuki used both kinds of perspective in her series of water-colours based on postcards and photographs of Italian cities seen more or less from above. She tipped the image upside down, to invert space, as in turning a glove inside out. Up became down, and down up, making basins of domes, and stalactites of steeples, and having boroughs float away like airships. The close-togetherness of the telescoped houses from the middle-ages seems rather utopian. Nanaé Suzuki has also applied inversion to small items of folded paper and painted models, the latter resembling snail-shells in whose spirals the world is mirrored and distorted, as if showing the earth's spinning. Also in her photographic portraits, the artist resorts to simple kinds of presentation, while avoiding what is typical of the genre. 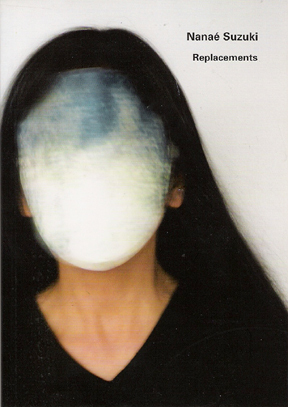 Framed by hair, her face is hidden behind a coloured, rather indeterminate mask-like layer. There are parts of photographed images blurred by motion, which lie as a coloured skin over eyes, nose and mouth. Sometimes butterflies and flowers can be made out, and sometimes numbers are on a puppet-like face. For some of these portraits, Suzuki has used earlier works. The curious construction confuses the relation between subject and object, viewer and viewed. Instead of physiognomy there is a blind spot where the usual process of vision falters. The artist does not so much show us herself as make us question the nature of vision. All works by Nanaé Suzuki, who since 1997 has been exhibiting in Kyoto too, have a typical lightness. The portraits replace usual with unusual images, and in 'Milky Way', which she made in 2000 for the exhibition 'Heimat Kunst' (Homeland Art) in the 'House of World Cultures', she replaced books with plates of glass bearing book-titles engraved backwards, and the books' weights forwards below them. As she said: 'On flitting, we are often vexed by having to choose between books,' and their weight may be decisive. Unlike the books themselves, the plates show that whatever is taken from one culture to another may then serve as a frame for a new image. 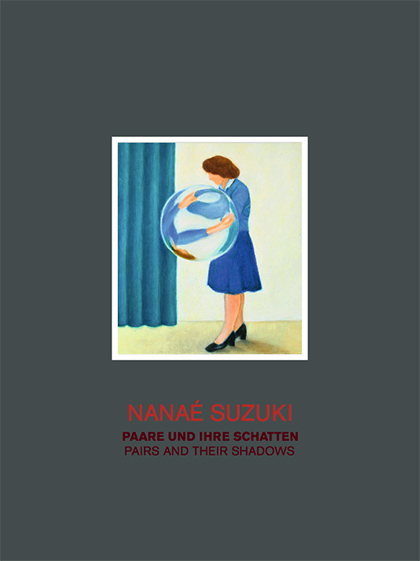 Nanaé Suzuki likes taking the situation of each exhibition into account. Not far from Berlin she was invited in Steinhöfel to work in the deserted library of an old castle. She used an inventory to create a memorial to the lost books from the 19th century, by arranging the titles on paper as lines on faces, whose play of the eyebrows and lines from nose and mouth recalled Japanese masks. These 'portraits' gazed at visitors to the library like book-ghosts at friends of their offspring. Space, the individual and history all become topsy-turvy in Nanaé Suzuki's works, which makes them hard to classify as purely western or Japanese. But this is besides the point. Nanaé Suzuki was born in 1947 in Kanazawa, Japan, studied from 1966 to 1971 at the State Art School in Tokyo, then came to Berlin in 1981. In 1995 she got a work-grant, and in 1997 an atelier-grant from the Senate of Berlin. Wall pictures were created in 1995 in Berlin, and in 1997 in Osaka. If the search for lost time is best described through literature, then the most fitting medium for the search for lost places is photography. Every photograph carries within it the longing to be present in a certain place at a certain time. Even scenes of horror and pictures of hell fulfill the desire for unlimited testimony. There are places and points in time that are bound together with emotions, which are sought out again and again. Clearly Nanaé Suzuki has gone to find such places, but with which technical device does she approach them? The mechanism of a photo camera usually consists of leading an outward phenomenon into a closable space and capturing it there on the celluloid band. In contrast, it seems that a photograph springing from Nanaé Suzuki’s camera shows a scene that takes place on the inside of the camera rather than in the world beyond the lens. Or is the film lit entirely by a fantasy or memory that bores through the eye of the photographer and the searchers into the darkness of the (reflex) camera? Subjective photography in its extreme form? That which can be recognized in the images is multi-layered and ambiguous. At first glance and from a distance, their character and choice of colors recall the medium of painting. The space one catches sight of is crooked, folded, labyrinthine, and has relieved itself completely of its three-dimensional coordination and its central perspective. The gaze glides through light-filled spheres over colorful structures and occasionally hits upon concrete objects, figures and places that emerge out of the image ground – sometimes veiled to the limits of their recognizable-ness or anamorphotically contorted. A universe gives birth to unpredictable encounters and preserves a moment; an image comes into being. The production of the photographs is such that objects, picture cutouts, optical elements and additional lenses are densely arranged in front of the camera. The scene is then recorded under daylight or sunlight using analog technology and with that, the photo is finished – not a single additional form of manipulation such as double exposure, montage, detail enlargement, etc., is employed. Finally, the object of presentation is a print optimally graded and with the highest color fidelity.